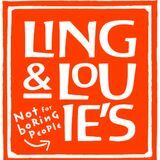 The Best Eye-Opening Cocktails at Ling & Louie’s Asian Bar and Grill For informed diners in the Treasure Valley, whether looking for the best sushi Eagle Idaho area has to offer or the best drinks in Meridian, there’s just one answer: Ling & Louie’s Asian Bar and Grill. 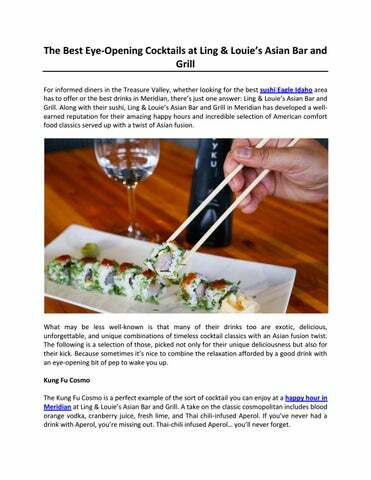 Along with their sushi, Ling & Louie’s Asian Bar and Grill in Meridian has developed a wellearned reputation for their amazing happy hours and incredible selection of American comfort food classics served up with a twist of Asian fusion. What may be less well-known is that many of their drinks too are exotic, delicious, unforgettable, and unique combinations of timeless cocktail classics with an Asian fusion twist. The following is a selection of those, picked not only for their unique deliciousness but also for their kick. Because sometimes it’s nice to combine the relaxation afforded by a good drink with an eye-opening bit of pep to wake you up. Kung Fu Cosmo The Kung Fu Cosmo is a perfect example of the sort of cocktail you can enjoy at a happy hour in Meridian at Ling & Louie’s Asian Bar and Grill. A take on the classic cosmopolitan includes blood orange vodka, cranberry juice, fresh lime, and Thai chili-infused Aperol. If you’ve never had a drink with Aperol, you’re missing out. Thai-chili infused Aperol… you’ll never forget.